If you don’t have a working fireplace in your apartment or house, you can still have a cozy fire thanks to new Fireglo fireplaces. You’ll see two of these fireplaces pictured below. But first, I want to tell you a story about how these fireplaces fit into a home. Last weekend, I went to a party at an acquaintance’s penthouse in Manhattan (really!). They had all sorts of fancy stuff – a massive TV, a modern glass bar, a balcony loaded with exotic plants, and a glass fireplace burning Fireglo gel fuel just like the ones pictured below. Where do you think the guests were crowded? If you said around the fireplace, you’re right. No matter how many fine things we have in our homes, a good old-fashioned fire is always the favorite. We’ve been staring into fires since the caveman days. It’s just something that humans love to do. 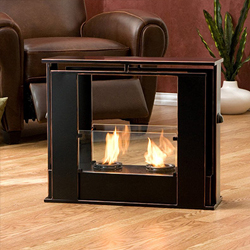 The fireplace sets a romantic, cozy atmosphere. But it’s also great for entertaining — everybody loves it! The tall glass panels on either side of the three Fireglo pots give you a clear view of the magnificent flames. This fireplace has a clean, modern loft style. 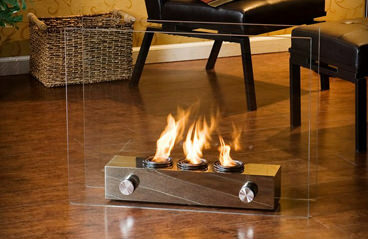 Enliven any space with this portable metal gel fuel fireplace. This unique design sits conveniently on a patio, floor, or table for instant relaxation. Finished with a painted black finish with copper edges, this fireplace will hold up to 2 cans of gel fuel providing a rich fiery glow perfect for relaxation. Thanks for reading – stay warm and cozy!